We'll make the decision to upgrade easy as Pie. Update 1:40 p.m.: Essential has pushed the Android 9 Pie update to its phone. It’s that time of year again. No, we’re not talking about back-to-school or the end of summer—it’s time for a new flavor of Android. And this year the tasty confection is... Pie. That’s right, the ninth version of Android has an official name and that means it’s ready to install on the precious few phones lucky enough to support it on day one. Can I get Android Pie on my phone? Yay, I have a Pixel, how do I get Pie? Easy. Once it’s available for your device (which could be today or tomorrow depending on your carrier and model), you’ll get a notification telling you that the Android 9 update is available. Tap it, press the install button, and restart when prompted to give it a whirl. If you don’t want to wait for the easy over-the-air delivery, you can also download the factory image to your PC and install it on your phone manually. It’s a little more difficult and requires a working knowledge of the command line on your Mac or PC, but it’s the only way to be sure that you’ll be among the first to have it on your phone. I have one of those other phones. How can I get Android Pie? If you have an Essential Phone, you can get it right now. Just head over to System update in the System settings and tap Check for update. The Android 9 update will appear and you can download and install it today. For the other phones on the list, you can either wait until the manufacturer pushes the official version to the public, or you can download the appropriate beta system images onto your PC and manually flash Android P onto your phone. It’s not for the faint of heart and you’ll be writing over very important system files, so you should definitely make sure you have a backup of your phone’s important data first. But if you choose that process, you’ll be well acquainted with Android Pie by the time the official public version arrives. Just be warned: Since these are still betas, some apps and features might not work so well (or at all). I alreadly signed up for the public beta. Do I need to remove it to install the new version? Nope. You’ll get a notification when the new version is available and you can install it right over the latest beta build. Plus, you’ll still get access to all future Android Pie betas. However, if you want to start from scratch, you can always perform a factory restore by going to Settings > System > Advanced > Reset Options >Erase all data (factory reset). Then you’ll be sure to get the best possible performance out of Android Pie. Android Pie brings support for all kinds of notches. In case you haven’t picked up an Android phone in the past few months, there’s a new trend: camera notches. And with the upcoming Pixel 3 rumored to include one too, Google did the logical thing and added display cutout support in Android Pie. You won’t notice too much of a change in non-notch phones, but apps and videos on phones such as the LG G7 and OnePlus 6 will be sure to display correctly once you install Android Pie. One notch-related change that will affect all phones in Pie is the status bar. Because the middle of the top of the screen is reserved for a camera, a few things have been tweaked to accommodate the loss of space. For one, the time has been shifted to the far left of the screen, leaving the battery icon and percentage (if you opt to display it) at the far right. Also, you can only see four status bar icons at a time, so you’ll probably be spending more time in the notification shade. Basically it doesn’t matter if you have a notch on your phone or not—Android Pie thinks all phones have one. While most people might not notice the status bar tweaks to accommodate the camera cutout, there’s one interface change everyone will recognize: the new Overview screen. 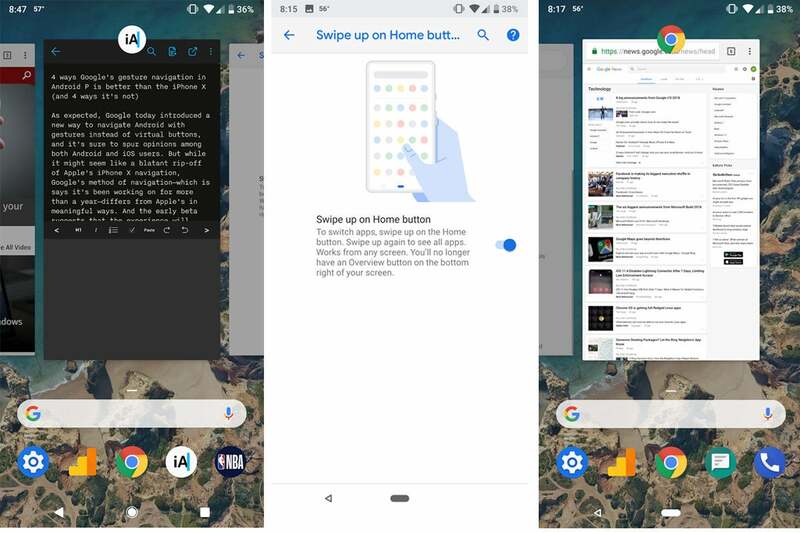 Android Pie’s new gesture-based navigation is optional, but it’s worth a test-drive. 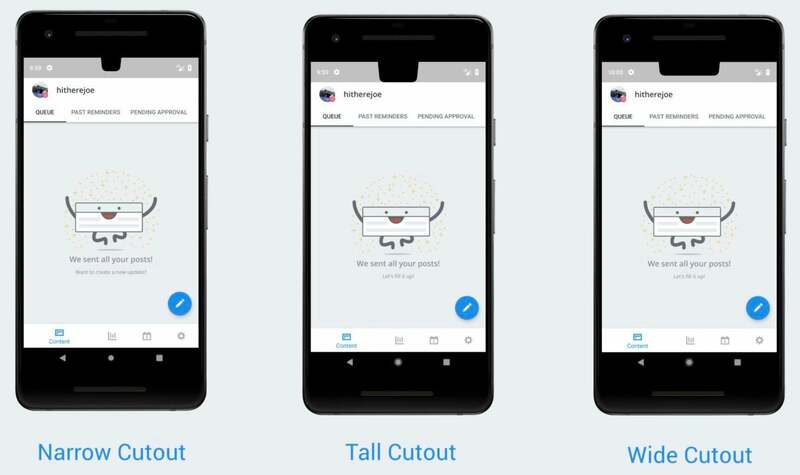 While the new Recent Apps screen is visible to all users, it’s mainly designed to take advantage of Android’s new optional gesture-based navigation. Head over to the System settings, tap on the Gestures tab and you’ll find a new toggle: Swipe up on home button. Turn it on and the nav bar will change from the traditional Back, Home, and Recents trio to just two icons: a small arrow and a pill-shaped home button. 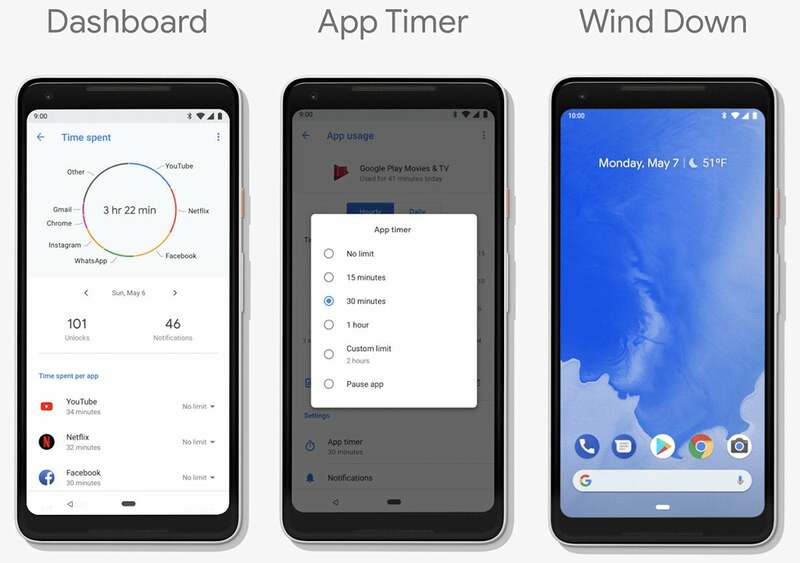 That’s where new gesture-based navigation in Android takes over, letting you jump between screens, quickly close apps, and interact with them in fun new ways. Granted, it’s sure to have its detractors, but we definitely recommend giving it a try. Check out our in-depth look at gesture navigation to learn how it all works. When you reply to a message or email directly from an alert you’ll get three suggested responses to choose from in addition to the usual typing field. You can long press on an alert to stop future notifications. Tap on a notification for an app that’s running in the background (like Waze) and you’ll get an option to shut it down. Tap on the screenshot notification and you’ll get an option to edit or share it without opening Photos. Tap the “Manage notifications” button at the bottom of the shade to go straight to the Notification Settings. If you constantly dismiss a certain kind of notification, Android Pie will ask if you want to stop showing them. Below certain notifications you’ll be able to tap a “Useful” or “Not useful” button so the system can learn to deliver only the alerts you want, even if every switch is turned on the Notifications settings. Android Pie’s notification are even more useful than they were in Oreo. And one more cool notifcation-related feature: If you tap the Do Not Disturb icon in the Quick Settings menu it’ll hide both current and future notifications for a completely distraction-free experience. Android Pie’s Adaptive Battery uses machine learning to help your battery last longer. Google describes it like this: “To extend battery life, Adaptive Battery limits battery for infrequently used apps. Your phone will learn how you use apps over time. Notifications may be delayed for these apps. That means your phone will actually be able to increase battery life over time as the system shifts priority to only the apps you use the most.” Once the system starts restricting apps, you’ll see them listed below. Also helping battery life is a more robust set of background restrictions. We first saw this with Oreo, but Android Pie takes it a step further by alerting you to errant behavior and giving you the option you shut down the offending app. It will also provide you interval updates on how long your phone is expected to last once the battery reaches 25 percent. Furthermore, Android Pie is also more aggressive when the battery saver is turned on, helping squeeze a bit more juice out of a dying battery. And finally, Adaptive Brightness has been given a dose of machine learning to keep to closer to your personal preferences and save battery by not changing so dramatically. App Actions in Android Pie are little shortcuts to places you regularly go. Android Pie’s biggest improvement over Oreo is its ability to help you get things done with less taps. And nowhere is that more apparent than with App Actions. A companion to the search-based App Slices (which are launching later this fall, likely with the Pixel 3), App Actions live in your app drawer, and offer machine learning-based shortcuts to common tasks. Underneath your suggested apps inside the app drawer you’ll see two additional suggestions that lead directly to a specific part of an app, like a contact within Messages or a place inside Maps. Tap it and you’ll instantly be whisked away to the appropriate screen. There’s no way to turn it off, so there will always be two options in the app drawer, and like suggested apps, it’s up to the system to decide what goes there, so App Actions aren’t always useful. Every Android release brings changes to the Settings app, and Pie is no exception. For one, it’s easier to identify tabs at a glance. Where Oreo’s icons were totally devoid of color, in Android Pie they’re each set against colored circles, making them easier to spot. There are some small changes throughout some of the tabs as well, most notably to the System settings. In Oreo there were separate tabs for Backup, Reset, and System updates, but in Pie, those options are all tucked away into a new Advanced tab. Like any API, RTT is wholly dependent on developers incorporating it into their apps and there aren’t any available still launch. But once they start arriving RTT is sure to be one of Android Pie’s best features. Digital Wellbeing in Android Pie is designed to get us all to put our phones down more. Back at its I/O conference, Google announced a new initiative for Android called Digital Wellbeing. Designed to help you manage how much time you’re spending on your phone, the multi-pronged effort offers a robust set of tools for tracking and managing your app usage. There are four components: Dashboard (a screen that breaks down how much time you’ve spent on your device), App Timer (which lets you set time limits for individual apps), Do Not Disturb, and Wind Down (which turns on Night Light and Do Not Disturb and fades the screen to grayscale when it’s time to sleep). But while Digital Wellbeing is part of Android Pie, it’s not quite ready for prime time yet. Google says it will officially launch on Pixel phones this fall and other devices “later this year.” For now, Pixel and Pixel 2 users running Android 9 can sign up for a Digital Wellbeing beta preview at www.android.com/versions/pie-9-0/digital-wellbeing-beta. 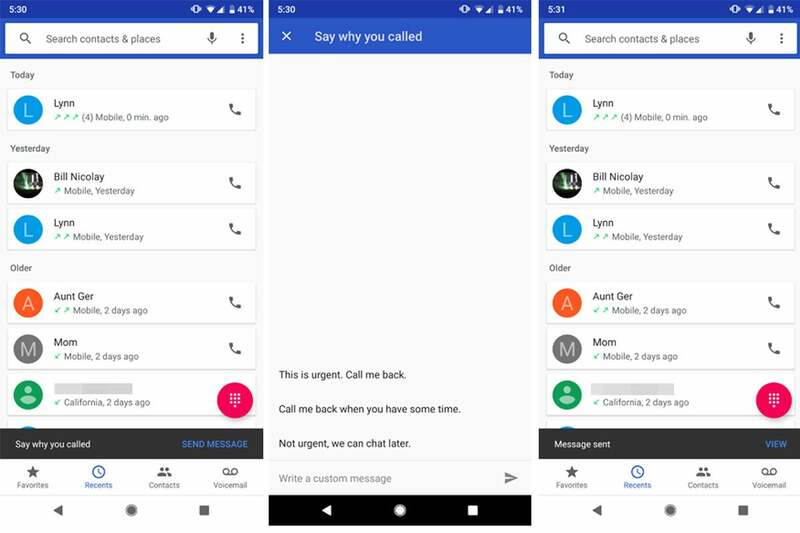 Android Pie offers a handy shortcut to message someone that didn’t pick up the phone. 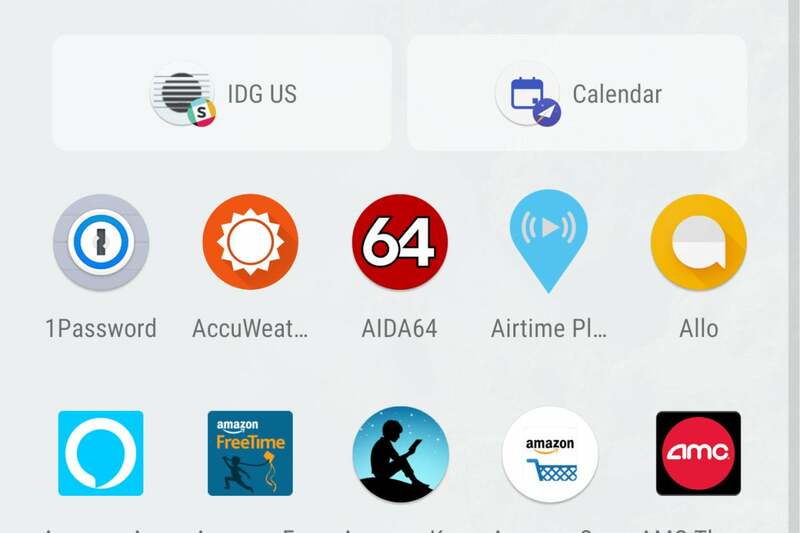 Android Pie is filled with smart notifications and shortcuts to cut down our taps and swipes, but some are less obvious than others. Here’s a cool one you might miss: When you call someone that doesn’t answer the phone, an alert will show up at the bottom of the Phone app asking if you want to send a message to the person you just called. Tap it and you’ll be taken to a new message screen with a few suggested responses as well as a field where you can type your own personal message to the person you just called. Choose or type what you want, tap the paper airplane icon, and your message will be sent without needing to open the Messages app. 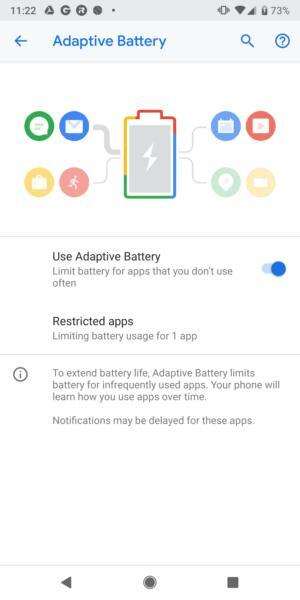 Android Pie’s Adaptive Battery feature uses machine learning to shut down unused apps running in the background and preserve battery life. While you can turn Adaptive Battery off in the battery settings, there’s no way to clear its history, so if it picks up a bad habit, the only way to fix it is to wait for the system to learn the right behavior. But there is a nuclear option. Head over to the Settings app, then the System tab, tap Advanced, select Reset options, and tap Erase all data. It’s extreme, but Google says it’s the only way to wipe out everything the Adaptive Battery system has learned. And since it learns so fast, it won’t take long for it to start enforcing its battery-saving knowledge again. 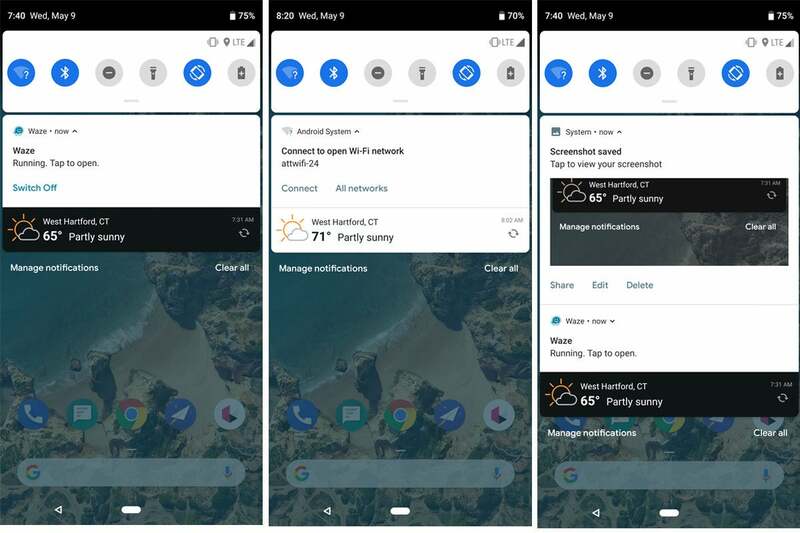 Android Pie lets you rotate your screen manually why auto-rotate is turned off. Every smartphone uses its accelerometer to smartly change orientation depending on which way you’re holding it, but as well all know, it’s sensitive and prone to false switches, especially when you’re lying down. Google has devised a simple way to fix it. It requires turning auto-rotate off. 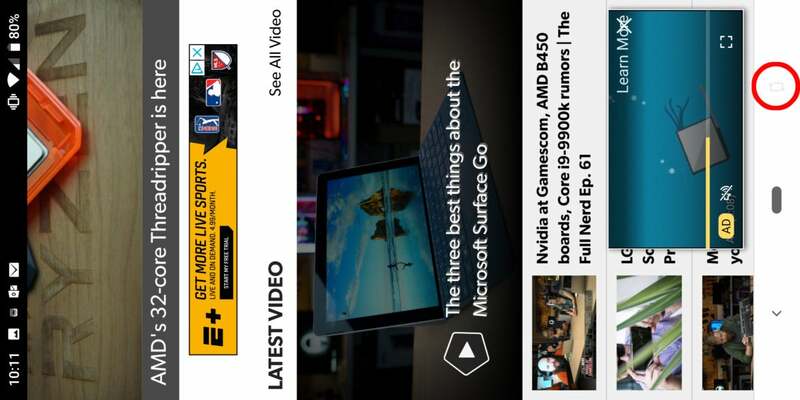 Say you’re using Chrome and you want to flip your phone to see something in landscape mode. Turn your phone sideways as usual and a small icon will appear at the far right of your navigation bar that looks just like the auto-rotate icon in Quick Settings. Tap it and you’ll temporarily lock your phone’s orientation in landscape mode. Flip your phone upright again and the same icon will appear, letting you change it back to portrait orientation. Genius! You can select text inside the app carousel in Android Pie as long as you’re using a Pixel phone. 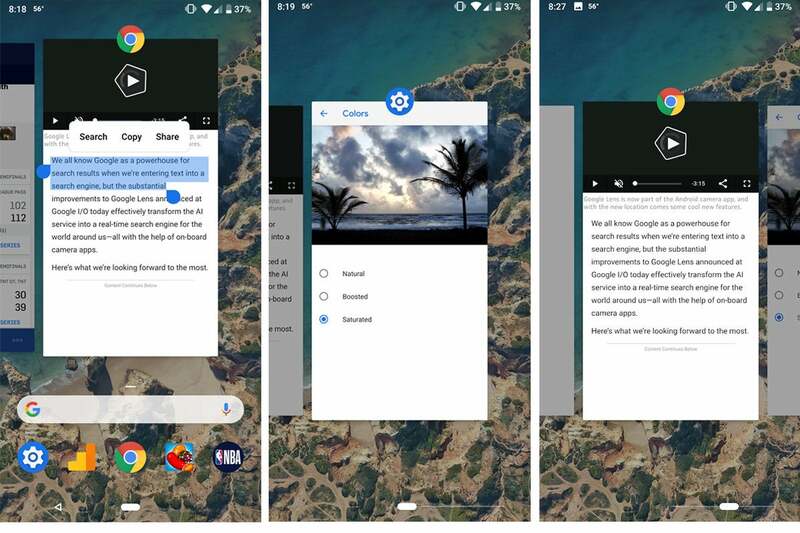 The new multitasking carousel in Android Pie isn’t just a snapshot of your recent apps. It’s also a way to quickly grab text or images to share in another app. Unfortunate it’s exclusive to Pixel phones for now, but when you’re in the Overview screen, you can long-press on one of the screens to either select a picture or bring up the handles for copying text without needing to actually launch the app full screen. Then you can copy it to the clipboard and bring it over to any other app. You can enable Developer options in Android even if you don’t know anything about making apps. You don’t need to be an app maker to enjoy the perks of being a developer. In Android Pie (just like previous versions of Android), there’s a hidden Developer Options tab that has some pretty cool experimental features. Here’s how to enable it: Open the Settings app and scroll down to System. Select About Phone and find Build number at the bottom of the screen. Start tapping it until you see a “You are now a developer!” message appear. Then you can go back a screen, open Advanced, and you’ll see a new Developer Options tab. Prior versions of Android limited Bluetooth audio device connections to just one, but Android Pie raises that limit to five. That means you won’t have to switch between paired devices anymore when you want to switch to a new one. You don’t actually need to enable anything to take advantage of it—just try to connect more than one device. But here’s a pro tip: If you want to change the number of devices your phone can concurrently connect to, you’ll first need to enable Developer options (see above). Then scroll down to the Maximum connected Bluetooth audio devices option, and pick a lower number. Android’s App Actions can be surprisingly useful, but there’s no telling when they’ll turn up. So if there’s ever one you want to keep, simple tap and hold on it and you’ll be able to drag it to your home screen to make a shortcut. That way you’ll always be a tap away from the action, even when the system doesn’t think you need it anymore. Android Pie finally brings a dark theme (kind of). Ever since Oreo, Android on Pixel phones have had a psuedo dark theme. 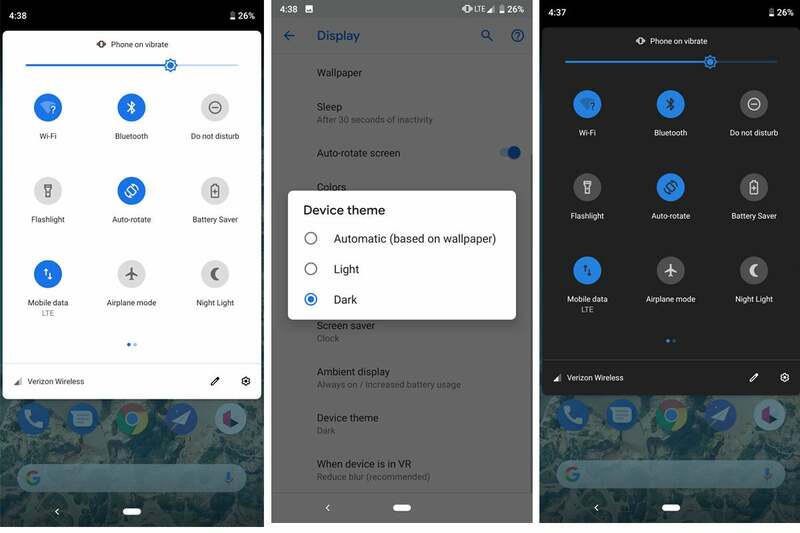 To enable it, all you needed to do was pick a predominantly dark wallpaper for your home screen, which triggered a black background for the app drawer and notification shade. Now you can enjoy it with any wallpaper. Just go to the Display tab in Settings, tap Advanced, and select Device theme. Then you can choose Light or Dark, or let it change automatically based on your wallpaper. One of the small changes in Android Pie that makes a big difference is the volume slider. Instead of appearing at the top of the screen, the volume controls show up as a vertical box next to the bottoms on the the right side of the screen. But the big change isn’t the new appearance, it’s the new default functionality. Pressing the volume button will now control the media volume by default rather than the ringer. So the days of accidentally turning your phone on vibrate are finally behind us. 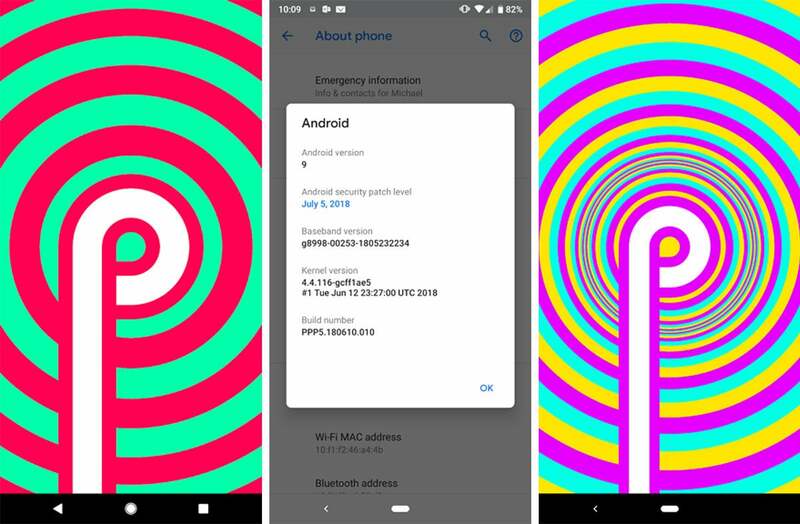 Android Pie’s Easter egg is trippy and fun. Google always hides a fun Easter egg inside its major Android releases, bit you have to know where to look. Here’s how to find it in Android Pie. Head over to the Settings app, select System, then About phone. Tap Android version and a pop-up window will appear showing things like the patch level and build number. Tap the first line (Android version) a few times and you’ll be taken to a screen with a giant P, surrounded by an animated and colorful series of circles. It’s not as cool as the Oreo octopus, but it’s still fun. And here’s an extra tip: you can pinch the screen to resize the circles or change the colors by pressing the back button.